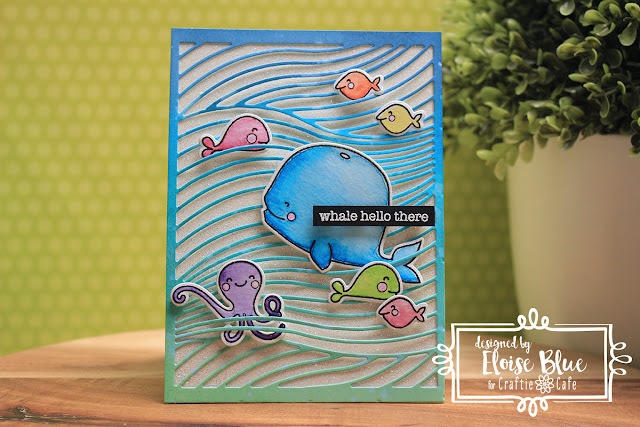 Hi everyone, Eloise here for Craftie Café and today I’ll be using the Whale Hello There stamp set from Memory Box along with the Waves Dies from Avery Elle to create a summery Hello card. I’ll also be using some Distress Oxide Inks and Lawn Fawn Glitter to help create the card. To begin, I stamped the images from Whale Hello There with black ink onto some watercolour paper and then used some Mijello Misson Gold Watercolours to colour my images in. Once I coloured my images, I used the coordinating dies to cut them out. Next, I took a piece of blue cardstock, but you could use white and used four colours of Distress Oxide inks in CrackedPistachio, Broken China, Salty Ocean and Faded Jeans to ink blend a gradient onto my paper. I then flicked on some water, picked it up with a paper towel to create a water splotch effect and then dried it with a heat tool. 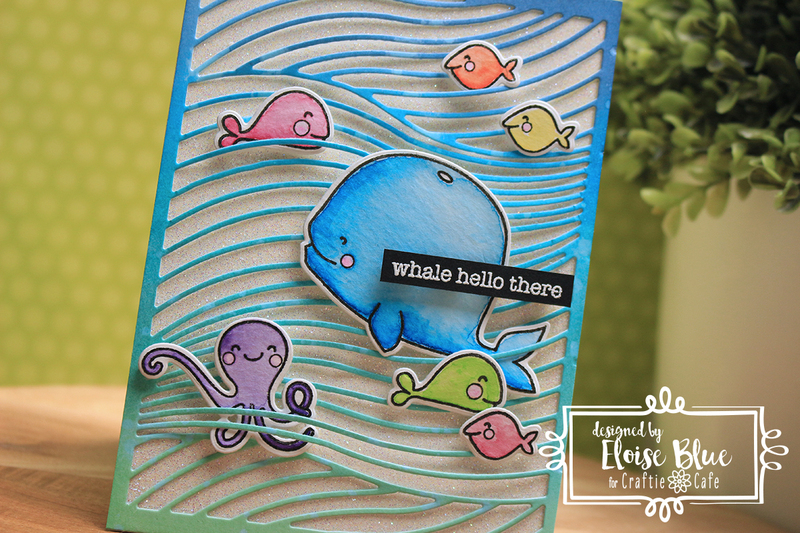 Next, I lined it up on the Waves dies from Avery Elle and ran it through my Big Shot Machine. I then poked out all the inner pieces of my background die and put them to the side to save them for a later project. I then decided to coat a piece of white cardstock with double sided adhesive and pour over some Prisma Glitter from Lawn Fawn, burnish it in with a bone folder and my fingers to create a sparkly, glittery background for my waves. I then added adhesive around all four sides of my waves background and adhered it over my glitter background. I used foam tape to adhere all my images into place, then whiteheat embossed the sentiment from Whale Hello There onto a strip of blackcardstock. I adhered that also onto my panel with more foam tape. Lastly, I adhered my panel onto a white card base and that finished up my card for today. Thanks so much for stopping by and I’ll catch you next time!